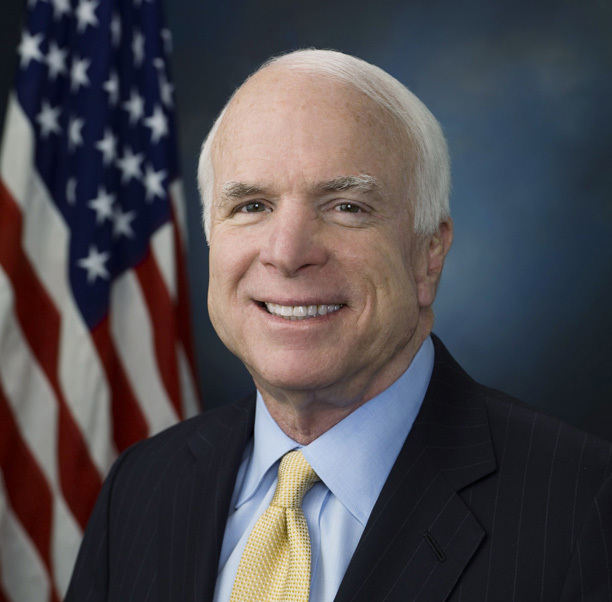 Awareness of glioblastoma heightened with the passing of Sen. John McCain. Here's what you need to know about this life-threatening form of brain cancer—and the progress being made to extend the lives of patients. Glioblastoma, a rare but aggressive type of brain cancer, took the life of Arizona senator and 2008 presidential candidate John McCain. Glioblastoma is a relatively rare brain cancer that affects 3 of 100,000 people in the United States. Pronounced “gly-oh blass toh mah,” it develops in star-shaped cells called astrocytes (see sidebar below) that spread quickly to other parts of the brain or spinal cord but not to other parts of the body. About 3 in 10 brain tumors are glioblastomas. It’s the type of cancer that took the life of Arizona senator John McCain. Glioblastomas can even develop their own system of blood vessels that support rapid growth. The abnormal growth also puts pressure on adjacent structures in the brain. The exact cause is unknown, but 5 percent of cases are associated with genetic mutations. Other possibilities are the cumulative effects of exposure to carcinogens and high-dose exposure to radiation. Glioblastoma, also known as glioblastoma multiforme (GBM), can occur at any age but is more common in adults over the age of 50, in men, and in caucasians and Asians. According to the American Cancer Society (ACS), people diagnosed with brain cancer do not have a family history of the disease. A report in Annals of Epidemiology found that increases of gliomas were greater among people who had melanoma than in people who had never been diagnosed with skin cancer. 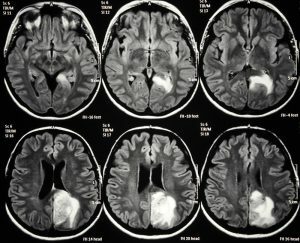 What Are the Symptoms of Glioblastoma? Possible symptoms of GMB include double vision, headaches, difficulty with speech, nausea, vomiting, weakness, and seizures. Symptoms do not necessarily persist. They may come and go, sometimes depending on the time of day. Changes in personality and memory loss are also possible. GMB is diagnosed by a variety of tests, starting with a neurological exam that may indicate the part of the brain affected. However, a definitive diagnosis requires a biopsy of cells in the area before or during surgery. A biopsy can determine the type and aggressiveness of cells. Brain Atrophy: Can It Be Reversed? What Is the Treatment for Glioblastoma? The standard treatment available to glioblastoma patients is surgery, followed by radiation and chemotherapy. The purpose of surgery is to remove as much of the brain tumor as possible, but complete resection is impossible, even when imaging shows no additional cancerous tissue. The more of the tumor that can be removed, the better the prognosis. Unfortunately, the recurrence rate is near 100 percent. An FDA-approved chemotherapy drug for the treatment of glioblastoma is temozolomide. It is taken orally and works by slowing the growth of tumors. Tumor-treating-fields therapy use an electrical field to interfere with the ability of cancer cells to multiply. Targeted drug therapy employs drugs that focus on the inner workings of cells that cause cancer or help cancer cells grow. What Is the Outlook for Glioblastoma Patients? The overall outlook for those battling glioblastoma is not good: Median survival range is 6 to 14 months. New therapies, however, are extending the life expectancy of glioblastoma patients to 16 to 18 months and beyond. In the case of Sen. McCain, glioblastoma was diagnosed in July 2017, and he passed away on August 25, 2018. Sen. Edward Kennedy died on the same date of the same disease in 2009. 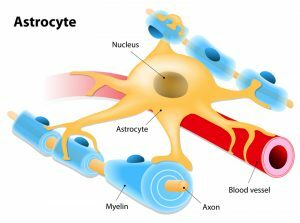 An astrocyte is a type of glial cell. In this illustration, it’s shown in relation to a blood vessel and (in blue) neurons. Primary, or de novo: These tumors tend to form and make their presence known quickly. This is the most common form of glioblastoma; it is very aggressive. Secondary: These tumors have a longer, somewhat slower growth history, but still are very aggressive. They may begin as lower-grade tumors that eventually become higher grade. They tend to be found in people 45 and younger, and represent about 10 percent of glioblastomas. You can contact the ABTA by calling 773-577-8750 or writing info@abta.org. Mailing address: American Brain Tumor Association, 8550 W. Bryn Mawr Ave. Suite 550, Chicago, IL 60631. American Cancer Society: 800-227-2345. The ACS’s website includes a page on types of brain and spinal cord tumors (click here). American Association of Neurological Surgeons: 847-378-0500 or 888-566-2267. The organization’s website includes a page dedicated to glioblastoma multiforme (click here). 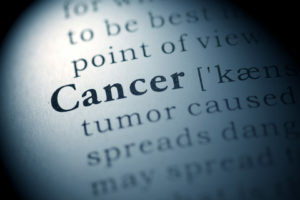 Cancer Treatment Centers of America: 855-483-7270. The organization’s website includes a dedicated brain cancer page (click here) and a glioblastoma page (click here) as well as an online chat. brain, brain atrophy, brain cancer, brain tumor, brain tumor causes, brain tumor symptoms, cancer, cancer cells, cancer treatment, cancers, chemotherapy, glioblastoma, headaches, melanoma, memory, memory loss, personality, positron emission tomography, radiation, radiation therapy, report, skin, skin cancer, tumor, type of cancer.